Adopt-A-Greyhound Month Helps Bring The Wonders Of Greyhounds To Light! April is national Adopt-A-Greyhound Month, and it helps remind us just how unusual the struggles greyhounds face really are. Dog racing is still a cruel pastime in some states, although only 7 states in the United States still have commercial racing, and the amount gambled on races has declined 67% since 2001. Sadly, there are still an enormous number of dogs that are cast off after years of abuse. Few people understand what these dogs are like after being raised in the races, and it always surprises them when they find out how amazing and loving these dogs can be. 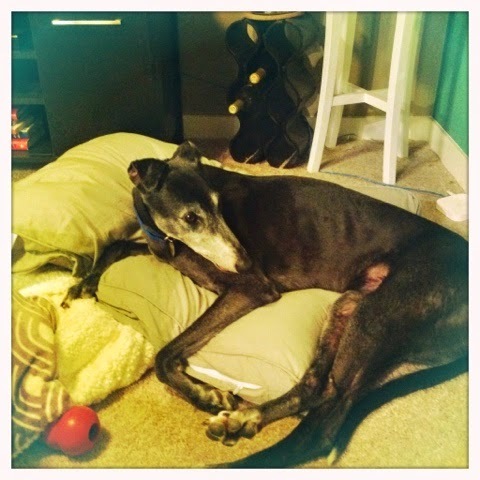 Luckily, a friend of the Animal Rescue Site wrote a wonderfully eloquent story about her adopted greyhound, Bella, that we would like to share, in the hope that it will inspire some new parents to help save some a greyhounds! I’m lucky to have an amazing dog sitter. I trust her. Love her as a person. And well, she’s just awesome. 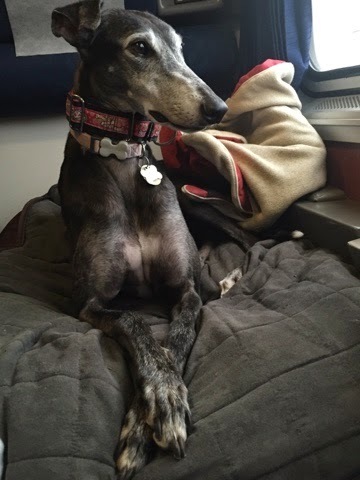 She works at an animal rescue shelter, and April is Adopt-A-Greyhound month. So when she asked me to write about Bella and I’s story, I happy obliged. Here I’ve dedicated a small amount of space to something that has brought me much happiness and joy. What a great phrase! This simple statement sums up Bella and I quite nicely. Bella is my greyhound. I adopted her in January 2014, just three short months after she retired from racing in Florida under the name Flirt with Me. She raced for 5 years. Yes, 5 years. And what you are asking yourself is right…isn’t that a long time? Why yes, yes it is. Most race dogs retire after 1-2 years. They either can’t perform, get injured or simply get ‘old’. But Bella had a great record, and they kept her around for much longer. What does that mean? Well she was part of race life for so much longer than most other dogs. She spent over 18 hours a day in a kennel. She had never seen another dog other than a greyhound. Likely didn’t get much love, petting or attention. Had never seen grass or well, the list could go on and on and on. She had no idea how to ask to go to the bathroom. What a toy was. A mirror, glass doors, stairs…all foreign to her. Because…for 5 years she was in a kennel and raced. That was it. I’ll let you come to your own conclusion on how graceful that life is. Bella was a huge leap of faith for me. I was working 60+ hours at a grueling job. I love to travel and be on the go. But I wanted a dog. I waited on the adoption list for 10 months, before I got a call saying they think they found a dog that fits my personality and that we’d be a good match. It is like dating, but for your doggie best friend. I got the call, and excitedly said yes! I’d love to take her…then my stomach dropped. I was going to be a dog owner. I had to care for her, love her, put her needs above mine, be patient, and most of all be ready for a BIG unknown and change. Both of our lives were going to change. My friends questioned me. Are you sure? It’s just you, are you sure you can handle this? You work, a lot. You like to travel. How is this going to work? I honestly didn’t know – I simply said, I’ll make it work. There isn’t a playbook that says how to do everything in life, sometimes you’ve just got to listen to your gut and go for it. I had to listen to that little voice saying I would be a good pet owner, that she would have a good home and that I would be happy having a dog in my life. So there it was, decision made, I was adopting a dog. I got a dog that was broken. She was scared beyond compare. Her little nose ran as she stressed with the anxiety of what this new world was. I saw in my dog, a being that had never had the opportunity to trust in someone else and know that she was going to be okay. For 5 years, she hadn’t been loved. And so it began…potty training and the realization that grass is fun. A growling at the mirror, ears perked and head cocked side to side as she greeted herself in the mirror for the first time. Confidence learning to climb the stairs and my jubilation as she looked back and wagged her tail at me “Are you coming Mom? !” The first time I saw her cuddle with her stuffed animal and then come home to a murder scene one day when she killed the teddy bear. I was one proud dog owner that day. 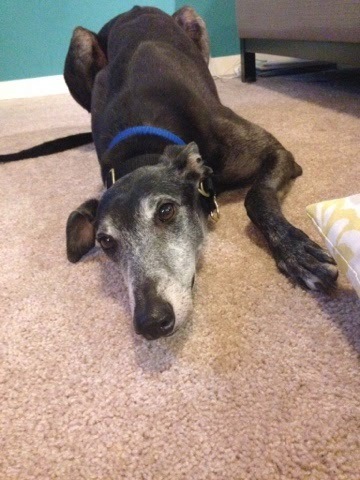 Bella was becoming a dog, slowly, much more slowly that other greyhound rescues, but she was there. Over the months of us coming together, she comforted me when I broke my ankle mere months after adopting her. She patiently walked with me while I painstakingly slowly hobbled around with crutches. We healed together in many respects. Crutches turned into recovery walks all over Seattle. She gained confidence and trotted along my side when I gingerly tried out my first jog in many months. She loved me. She brought me back into this world and looked at me with loving eyes, telling me it was going to be all okay. Because of her, I started following my dreams. Coming up on a year and a half later, she’s my Bella, Bells, Little One, PooperScooper, and a few more nicknames I have in my back pocket. She’s ridiculous and I love her for that. I broke one of my steadfast rules. No dogs in the bed. Ever. At least that’s what I said. And guess what…man I love cuddling with her! Yeah she tries to hog the bed, but there are prices to pay that are definitely worth it. We walk all over the city and we are likely easy to spot (so feel free to say hi!). She’s the most beautiful black greyhound I’ve ever seen. Yeah I’m biased, but truthfully, you’ll see for yourself. She’s half my height and over half my weight, and we own these streets! We hike together. Camping trips…oh yes, she’s ready for some fire side lounging with friends. We’ve taken cross country road trips, been on the Amtrak trains, blissfully nuzzled up in fancy hotel beds, stolen the hearts of so many of my friends, and killed many many more stuffed animals. She races around my apartment in the morning, so excited she can’t contain her joy that we’re going for a walk or that I walked through the door and came home. All those fears I had, well they are still there. That’s the honest portion. I worry-Am I a good pet owner to her? Does she know how much I love her? Did I just screw up something? Am I patient enough? And, my answers – we are a team. She saved me. She loves me even when I’m not perfect and I love her even when she gives me ‘the look’ that she has to go potty…at 2 am. She reminds me to slow down, stop at the park and sit in the grass – She has needs too, those squirrels and birds need a good staring at. Adopting Bella is one of the best things I ever did. Who rescued Whom? I think she takes the prize in that department. I’m the lucky one. Thank you Tanya, not only for sharing your inspiring story, but for rescuing such a wonderful pup! Bella is the perfect example of what a kind heart and loving home can do to change a life. And you can help as well by helping stop dog racing in the entire country! Sign here! For more information about Tanya, visit her blog!